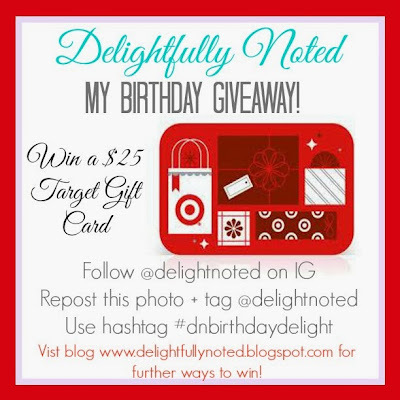 Target Gift Card Giveaway:Happy Birthday to Me! Today I turn five years younger-amazing I know. I am like my own version of Benjamin Button. I figured it's been awhile since my last giveaway so to celebrate I am giving one lucky pal a $25 gift card to Target!! I am super jealous of my own giveaway but it's my birthday and I can cry if I want too....or just eat lots of cupcakes. There are a few ways to win including reposting, tagging, and hashtagging it up over on Instagram or enter below through Rafflecopter. IG entries will be counted over there not through Rafflecopter below so make sure to follow the instructions in the above image if sharing on Instagram! Sorry, open to US & Canadian Residents only! I love reading your blog. Id buy you clothes, since new clothes are the best after having a baby. I would buy you a new purse in a fun color to brighten up the winter months. Happy birthday. Thanks for the chance to win. Happy Birthday to you! Hope you had a great day celebrating! What a fun time to have a birthday! Lets see, I'd probably buy you a fancy new phone case. I have no idea what your phone case looks like, but I saw some super cute ones at Target the other day...oh, wait-- that's what I'd probably buy myself!?! I would buy nail polish! Happy Birthday! I love your Instagram photos, so beautiful! Happy Birthday! I would get your a scarf . I was there today and saw the cutest polka dot mirror jewelry box! I think that would be a great present! I would get you some bubble bath! Happy Birthday! I would buy some awesome picture frames for baby pictures. I love showing off my pictures and I am sure you do also. What would I buy you? Probably some cute craft supplies!! I would buy a nice candle holder with a pretty candle. I would buy a pair of boots! YAY! Thanks so much and HAPPY BIRTHDAY to you!!! Wishes for many happy years to come! I would buy you candles, chocolate, and some beauty/bath products. Thank you for the giveaway! I would get you a giftcard. LOL for essentials. I always avoid buying clothes ourt of fear I would offend by getting the wrong size. You can't go wrong with a box of chocolates or other edible treats. I would get you a cute new hat! Bath & body products, chocolate and a candle!! Cupcakes...sounds crazy, but target's cookies & cream cupcakes are delicious! I'd buy you some cute stationary and craft items! I'd get you a new cardigan...Target has such cute ones! I would buy you a nice candle. Happy belated birthday pretty momma!